When Ancestry launched Ancestry Academy back in April, it did so with a lot of hoopla, a core of course offerings and a promise. And that promise to add new courses regularly? It’s been kept. With courses like “Who is That Tick Mark? Using Early Census Records,” with J. Mark Lowe. “Brother vs. Brother: Exploring Civil War Ancestors,” with Amy Johnson Crow. “The Mystery of Manuscripts,” with Pamela Boyer Sayre. “Tracing French-Canadian Ancestors and Learning Their Stories,” with David Ouimette. And, now, one more new one. 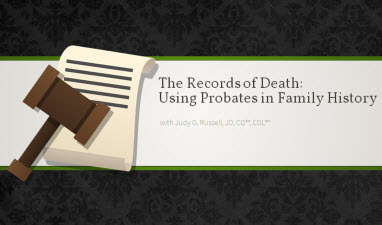 “The Records of Death: Using Probates in Family History.” Presented by The Legal Genealogist. The Lingo of Probate Law; Estates with a Will: Procedures; Estates with a Will: Records; Estates without a Will: Procedures; Estates without a Will: Records; Special Records of Widows: Dower & Set-asides; Special Records of Children: Guardianships & Indentures; Finding Probate Records; Using Probate Records; and Limits of Probate Records. Nice write up, Judy, and I’ll definitely go check out some of the courses – including yours. One can never get too much of Judy Russell! And may I say that your Sources are a constant source of amusement to me – I snorted my morning coffee reading #6. Nonetheless, I am going to have to do some careful editing of some of mine before turning them out in public.